A day on the moon with your kids. Seriously amazing! Do your kids LOVE volcanoes, are they fascinated by their power and their might? Do they love the moon? Because if they do, you are simply going to love the Lanzarote volcanoes. Lanzarote is a volcanic island just off the coast of Africa, owned by Spain (more below) and is simply amazing in its landscape. It appears strange, almost bizarre with its moon-like volcanic landscape. There are few green areas, hardly any trees, many reddish-brown lava masses and fields of sharp black lava rock. That combined with great beaches and great climate makes it a great kid friendly destination all year round. The Canary Islands are owned by Spain and sit off the coast of Africa. 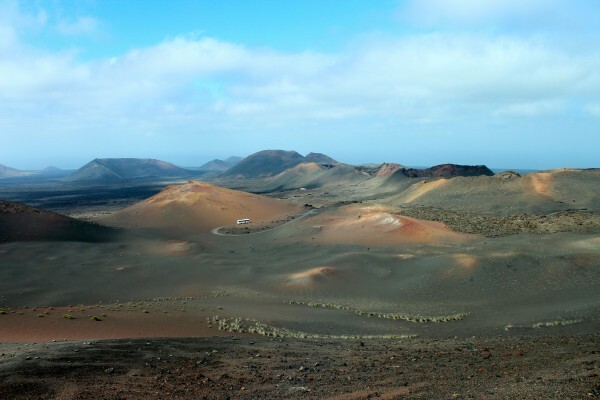 Lanzarote lies furthest to the north-east of all of the islands, is only 140 km from the coast of Africa and at 845 sq. km (about 60km wide and 20km long) is the fourth largest island. This lovely compact size makes it a great place for a day trip and you can cover a lot of ground in a day, which is all we had when we stopped for a day when on a cruise. 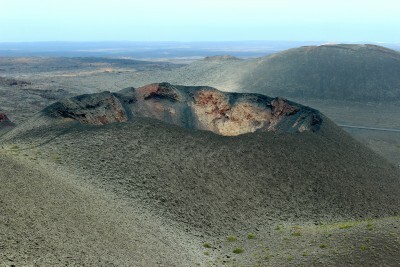 Lanzarote was shaped by the huge volcanic eruptions which took place in the 18th century. From 1730 to 1736 fire and rocks spewed forth almost continuously. The lava mass covered a third of the island. Whole villages disappeared and a great deal of fertile land was buried under several metres of lava and ash. Anytime! Seriously, because it is close to equator, it has a great all year climate, and doesn’t get very cold! We hired a car and I’d recommend that. I always think that having your own car allows for as many stops as the kids need, and meltdowns can be managed much easier in your own car! There is a very good hire car company which is near the port (and in numerous other locations). The roads are excellent, very easy to drive and well signposted. The hire car company also gives you a good map if you need it. Also free car seats for kids!! The absolute top of the list has to be Timanfaya National Park or ‘Fire Mountains’. The name says it all really, it is a national park full of volcanoes and lava fields. More than 30 volcanoes were formed in an area of 50 sq. km in the 18th century eruption. In 1974 this area was declared as National Park (Parque Nacional de Timanfaya). A visit to this park is a must for everyone. lt seems as if the eruptions happened only yesterday and you get to see it all up very close and experience the forces of nature. We drove there and since only a certain amount of cars are allowed in at one time and tour buses get priority, you should try to get there early, to avoid the crowds (and avoid kids getting grumpy waiting in the car). When you buy your tickets for entrance it includes a tour of the park in a bus as you are not allowed to drive it on your own. The parking at the visitors centre has toilets, cafe and restaurant, plus fabulous views across the lunar like landscape! The bus tour takes you around the Lanzarote volcanoes, it goes for about half an hour with good commentary in several language (including English). My two kids (9 and 5) were very happy on this bus and completely enthralled looking out the windows at the volcanoes and the various lava flows. After the tour we had lunch at the restaurant which cooks its meant over an open pit from the volcano! We really only ate there because I wanted the experience of eating meat cooked on a volcano. 🙂 The food was delicious and the staff very happily agreed to split a main meal between the kids (delivered it on two plates) and it was still too large for them to get through so they were very good sized meals. 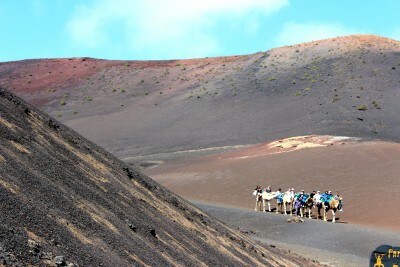 Just down the road from Timanfaya, there is a place where you can ride the camels. It seemed like a great idea for the kids and they did love it! For adults, I thought the path we went on was not that interesting, and was a bit of a let down after the amazing views we had just seen at the National Park. Nonetheless, for kids I would recommend it, it is only about half an hour and was reasonably priced. This is actually the house of the architect and artist César Manrique which has been turned into a museum of his work. It sounds dull doesn’t it? And not that kid friendly? Well we found that it was pretty cool and reasonably kid friendly. It’s got some great imaginative buildings with spaces that intrigued the kids, but I was often telling them to make sure they don’t touch anything! 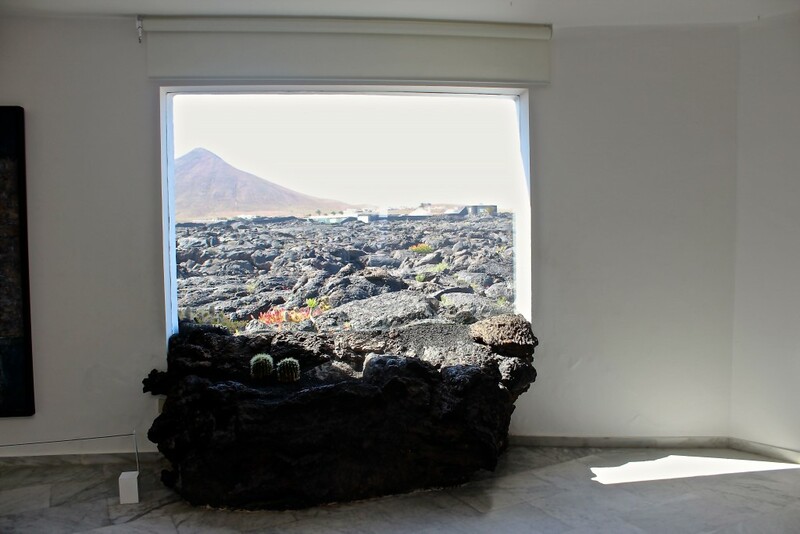 The house is built over a stream of petrified lava, five volcanic bubbles have been incorporated in the building. The kids were enthralled by the lava that seemed to be spewing into the house through the windows. The outside space is also nice and has a small amount of room for the kids to move and play a bit. My 9 year old said that he thought “it was the coolest house ever!”. 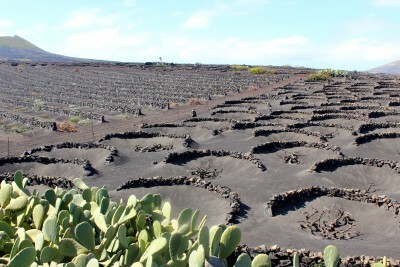 lf you take the road from Uga to Masdache, you come through the wine growing area of Lanzarote. Driving along this road is just amazing, because you are completely bordered by a lava field. It is completely black with no trees or vegetation and like nothing I have experienced before. 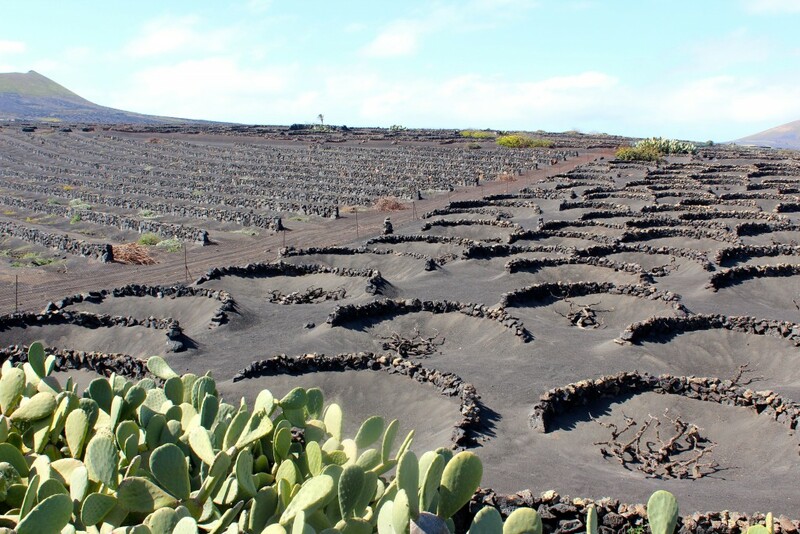 The locals have had to be very inventive and resourceful and created little walls out of the lava stone which protect the vines from the harsh weather and wind. It’s a pretty impressive sight to see. For the kids it wasn’t that exciting but we were able to have some talks about how difficult it must be to live in a place like Lanzarote and how awful the volcano must have been. Unfortunately, that was all that we were able to fit into our day in Lanzarote but there is much more to see if you have time. We loved it and would definitely return. If you are looking for more information about the island and other things to do, you can try this site. 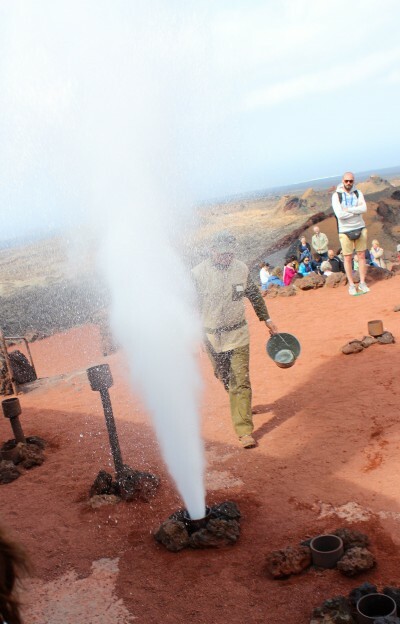 Have you been to Lanzarote, what did you do and was it kid friendly? Review it or Add it to our site.